American Pancake: 2012 Tour: Radiohead debuts New Songs and Thom sports a pony tail. 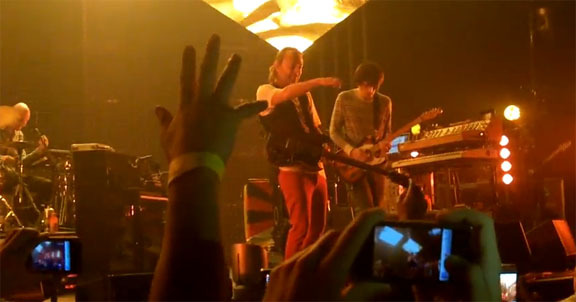 2012 Tour: Radiohead debuts New Songs and Thom sports a pony tail. Miami- oh you are so lucky as you were the location of Radiohead's first stop on their 2012 tour! Thom Yorke doing that vest over a t-shirt look and sporting a pony tail looked very much like some jazzy French hipster. Courtesy of Consequence of Sound- below is their Set List which included two new songs- Identikit which would of felt quite at home on Kid A (it instantly has great melody lines and dynamic breaks that pull you in) and Cut a Hole which feel a bit Hail to the Theify to me.